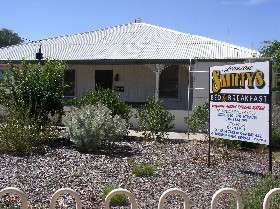 Loxton Smiffys Accommodation offers 4 self contained, comfortably furnished homes and 1 cottage. The homes are ideal for groups of families or friends, travelling business people or sporting groups and the cottage is suitable for 2 people. 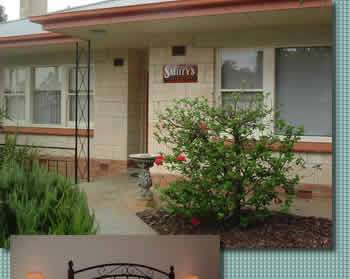 Located at Loxton in the Riverland of South Australia, all of Smiffys Accommodation is conveniently situated close to the town centre and essential services. Your comfort is important to hosts Christine and Phill who will endeavour to meet your individual requirements to ensure that your stay is an enjoyable and happy experience. Loxton and the Riverland region have plenty of events throughout the year along with interesting attractions and there are always lots of activities such as swimming, boating, fishing, wine tasting, shopping and dining to add to your holiday enjoyment. 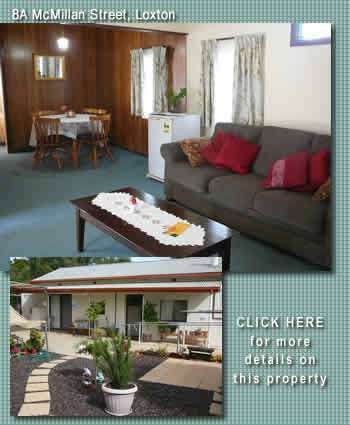 ***BOOKPURNONG TERRACE.......... Offering all the comforts and conveniences of home this property includes:•Sleeping arrangements for 7 people . 1 queen size bedroom, a twin room and 2 annexes each with a single bed. The twin room can be turned into a king bed on request..... •A hearty breakfast supplied for each guest daily..... •Large lounge room with TV and video.....•Separate Dining Room.....•Well equipped kitchen with oven and microwave.....•Full laundry including washing machine and dryer.....•Double carport.....•Large backyard fully enclosed.....•BBQ and outdoor entertaining area under sails..... •Pets are permitted but not on carpets. Exceptions for specialist dogs. A dog kennel is supplied..... •Picnic facilities including picnic basket, tables and chairs supplied on request..........***8 McMILLAN STREET..........This accommodation is a comfortable home with an enticing outdoor entertaining area. The home includes:..... •Sleeping arrangements for 5 people. Bedroom 1 queensize; bedroom 2 contains 2 single beds and the third bedroom has one single bed.....•Hearty breakfast supplies daily.....•Carport - undercover parking.....•Rails in the bath; step in shower.....•Separate toilet (not in bathroom).....•Laundry inc. ironing board, machine, dryer.....•Air conditioning / heating..... •Pets are permitted but not on carpets. Exceptions for specialist dogs. 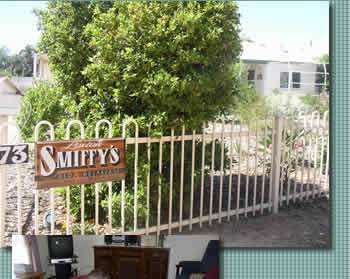 Dog kennel in enclosed backyard..... •BBQ and well lit BBQ area with outdoor furniture and gazebo..........***SADLIER STREET..........This accommodation is the Holiday Access House for people with disabilities and their carers. Extensions to the house have been purpose built for wheelchair access. The house provides:•Sleeping arrangements for up to 12 people..... 1 queen bed, 1 double, 1 bedroom with 3 single beds, 1 bedroom with 4 single beds. •2 lounge areas with sofa lounges, TV, Sound System, Video and DVD player, other lounge area includes a fully adjustable lounge chair to assist raising a person..... •Well equipped kitchen with dishwasher and dining area which has 2 dining tables..... •Family area with sofa lounge....•Two bathrooms, and two toilets, one suitable for wheelchair access.... •Bell alarm system for communication between the Carer and Client..... •Laundry with washing machine and iron..... •Air conditioned and wood combustion heater.....•Inner garden area for children and pets safety..... •Pets are permitted but not on carpets. Exceptions for specialist dogs..... •Car parks for 7 cars/boats/trailers etc.....•Sensor lighting.....•Meal deliveries can be arranged by prior notice..........***MARJ'S COTTAGE.......... This accommodation is a 1 bedroom cottage which includes a lounge/dining room, small kitchen and laundry/bathroom.....•Sleeping arrangements for 2 people. A pullout sofa bed for small child can be organised.....•Dining/Lounge area.....•Compact, well equipped kitchen.....•Hearty breakfast supplies daily.....•Carport - undercover parking.....•Large shower area with rails.....•Separate toilet (not in bathroom).....•Laundry inc. ironing board, machine, dryer.....•Air conditioning / heating..... •Pets are permitted but not on carpets. Exceptions for specialist dogs..... •Outdoor table and chairs.....•Tea and coffee making facilities.....•Clothes line..........***CORAL STREET.......... 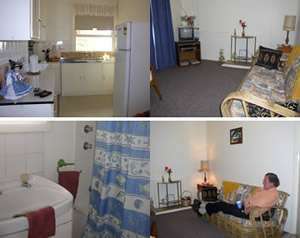 This accommodation is booked out in week blocks and the house is serviced weekly. It is ideal for use as an office base of the travelling workers who need accommodation for extended periods. 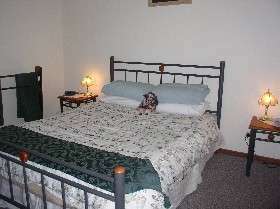 The house includes: •Sleeping arrangement for up to 6 people. Bedroom one has a queensize bed, bedroom two a single bed and bedroom three has two single beds.....•Lounge with TV and video player.....•Heating and cooling - Split system.....•Hairdryer in bathroom.....•Electrical equipment.....•Fans on stand.....•Washing machine, gas hot water system, toaster, jug, fry pan, electric stove, iron..... •Pets are permitted but not on carpets. Exceptions for specialist dogs. Exception for Specialist dogs.